Discover the rich and nourishing colour combinations to create a warm and inviting atmosphere in your home with Creme Brulee. This palette is about creating a home where we can surround ourselves with the people and things we love – and also where we can be kind to ourselves. It’s about having somewhere to enjoy time with friends, neighbors and family. Richly pigmented shades, including bold teal and intense terracotta red, combined with Creme Brulee, help to create space a that’s warm, cozy and comfortable. Here we’ll show you how to make the most of this inviting palette. 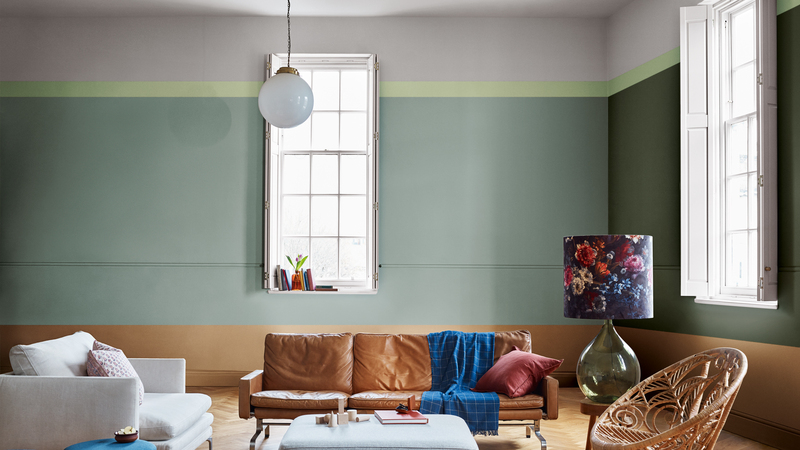 Creme Brulee, Dulux Colour of the Year 2019, sits easily amongst this rich palette of nourishing tones. Above, in this older kid’s bedroom, the look is all about depth and texture. 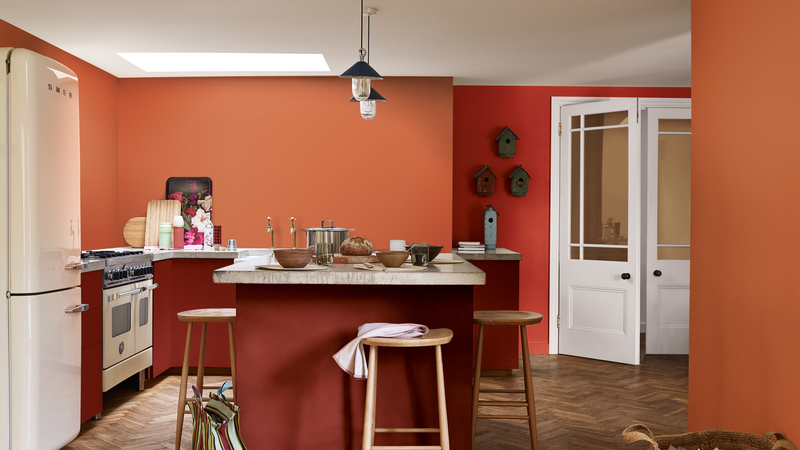 A spicy orange is painted on the upper wall, with Creme Brulee below and the two are united by a cool band of bright red honeycomb shapes that add character to the room and sharpen the look. Simple wood and wicker furniture complete this natural, earthy mood. For a quick and easy guide to painting a hexagon, watch our step-by-step guide on How to paint a honeycomb. In this laid-back living room, the walls are painted using a vivid sage green with a slim line of vibrant mint defining the ceiling. Likewise, the lower wall is painted in Creme Brulee , which brings a natural element to the mix that’s echoed in the unfussy materials of the tan leather sofa and retro wicker chair. Not sure where to start with stripes? Our quick guide on How to paint a ceiling stripe will have you mastering the technique in no time. This mood is all about confidence, so be bold about your colours choices. The walls of this welcoming kitchen mix rich complementary shades; warm orange with intense terracotta and Creme Brulee combine to create a positive and engaging atmosphere that is softened by the simple wooden furniture and homespun accessories. 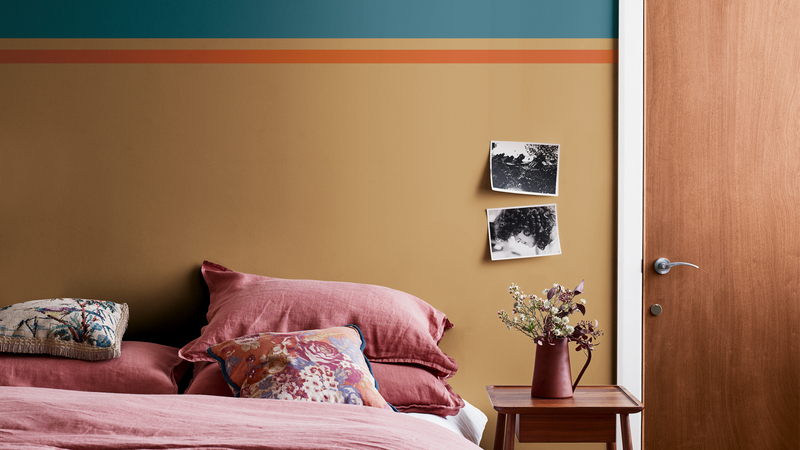 Create a cozy space to enjoy at the end of a long day with a rich but soothing mix of our Creme Brulee, Dulux Colour of the Year 2019, with touches of terracotta red and teal. These shades are painted in bands around the room at ceiling height to add interest and create a strong look. Pottery accessories and simply hung pictures emphasize the relaxed mood in this room.